One of the first engine modifications you might try is changing the air/fuel mixture of the engine. 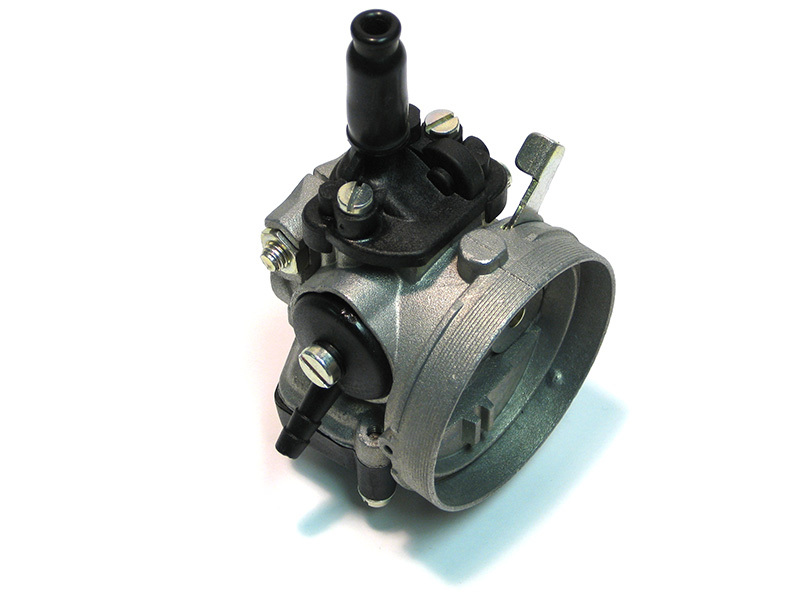 This is done by changing the small brass jet you've seen during carb cleaning process. 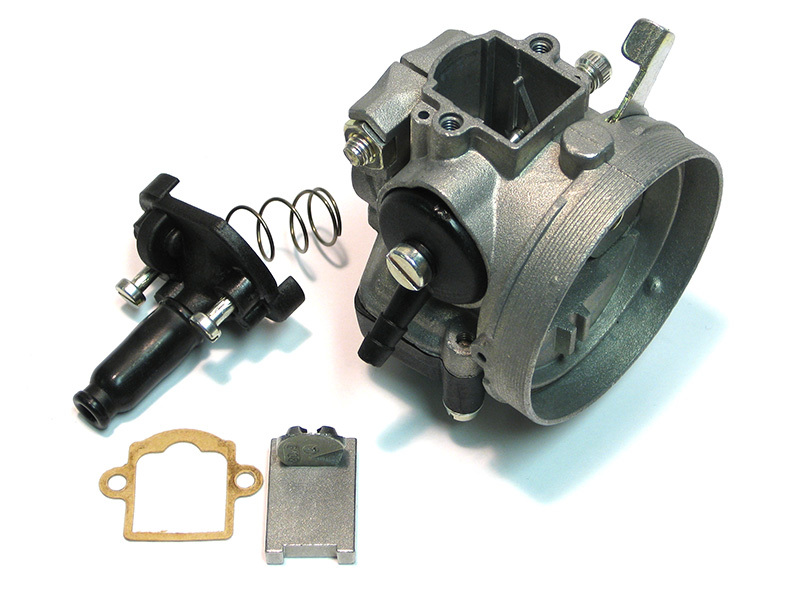 The OEM Comer carburetors come with a main jet that is marked with a number 58. This number relates to the size of the orifice in the jet. You can purchase jets with a larger number/orifice or smaller number/orifice. If you want to “lean out” your air/fuel mixture you buy a 57 or lower jet. If you want to “richen” your air/fuel mixture buy a 59 or higher jet. When you lean out your mixture the engine may run better at high rpm but be sluggish from the start. When you richen your mixture the kart will accelerate quicker but may not reach peak RPM. Sounds simple right? And really, it is, but you will see people changing jets all the time. We have found a jet around .025” works most the time. For beginners the 58 jet works the best. Check your local, regional or national track to find out their rules. The "WKA" World Karting Association has a rulebook that most tracks follow and they say that a 58 jet is the maximum size with no larger than a .026” hole size. We have found a jet around .025” works most the time. 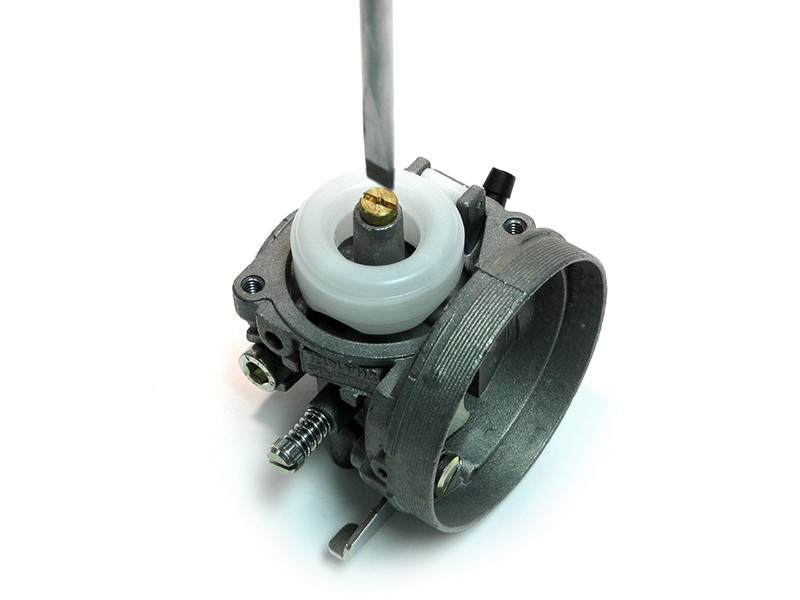 Remove the carburetor from the motor using a 5mm Allen/Hex wrench. We have removed the accelerator cable and fuel line for our example. While this is not mandatory, it does make it easier. Carefully turn the carburetor upside down over a container and let the gas drain. Remove the two screws shown above. The screws are part of the float bowl and only need to be backed out of the carburetor body not completely removed. Once the float bowl is remove you will see the jet sitting right on top surrounded by the white float. Do not apply any pressure to the float, as you may damage the needle located underneath. Place the blade of the screwdriver into the groove on the top of the jet and back it out as shown above. With the jet removed, inspect to make sure there are NO pieces of dirt or debris are inside the float chamber. Clean as needed. Using the screwdriver install the desired jet being careful not to over tighten or damage the jet. Inspect the float chamber gasket/o-ring before replacing the float bowl. Make sure it is sitting in the grove and that it is in good condition. 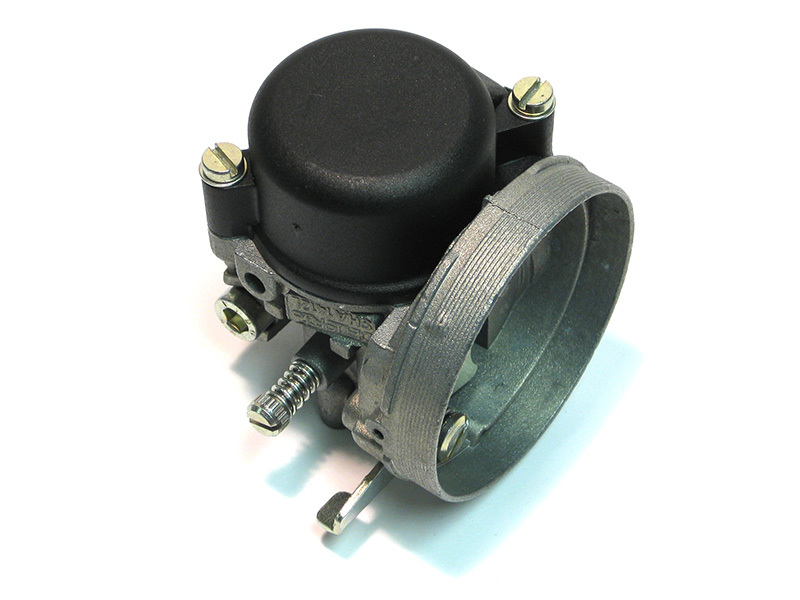 Place the bowl back on the carburetor and tighten the screws evenly to ensure the gasket seats correctly. Do a visual inspection of where the bowl meets the carburetor to make sure there is a proper seal. That's it, you have just re-jetted your carburetor. Be sure to get the PKT Comer Jet Holder so you can neatly store and find your jets! 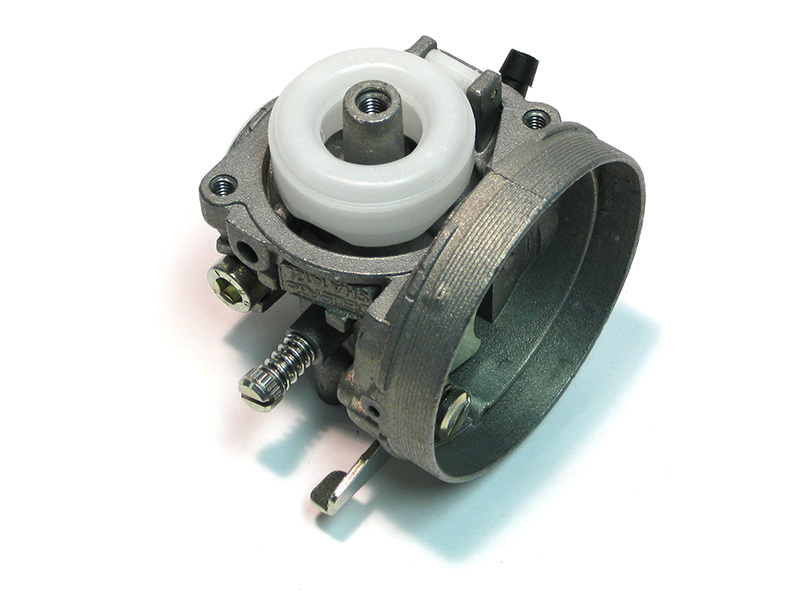 To protect the carburetor, we recommend getting the PKT Carb Support. 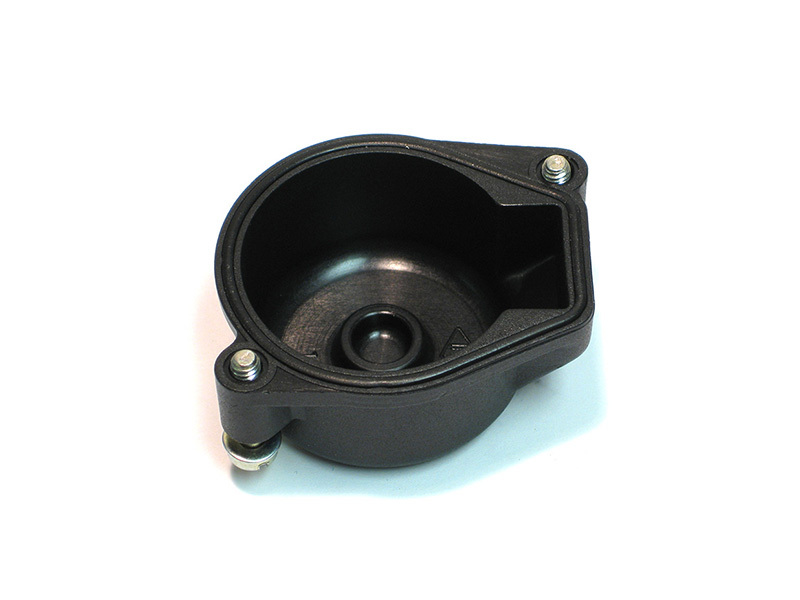 This will make the carburetor less susceptible to breaking.